Pads | New England Custom Gun Service, Ltd. PRODUCT NOTICE: Due to the popularity of our NECG "Universal" & "Quick-Mount" Recoil Pads, and given the fact that most gunsmiths and customers prefer to directly attach the pad to the buttstock, NECG is now selling the "Quick-Lok" interchangable pad mechansim as a separate option. If you want to use the "Quick-Lok" feature, simply add the G-175 "Quick-Lok" Kit to your order. NECG "Universal" and "Quick-Mount" Recoil Pad "Quick-Lok" Pad Mechanism lets you conveniently change pads on the same gun for summer or winter use or for sharing the same gun between two or more people. The "Quick-Lok" mechanism keeps the pad secure, yet the pad can be changed in seconds. Some gunsmiths find it easy to fit and finish the pads when using this feature as well. Order G-175 when placing your order. 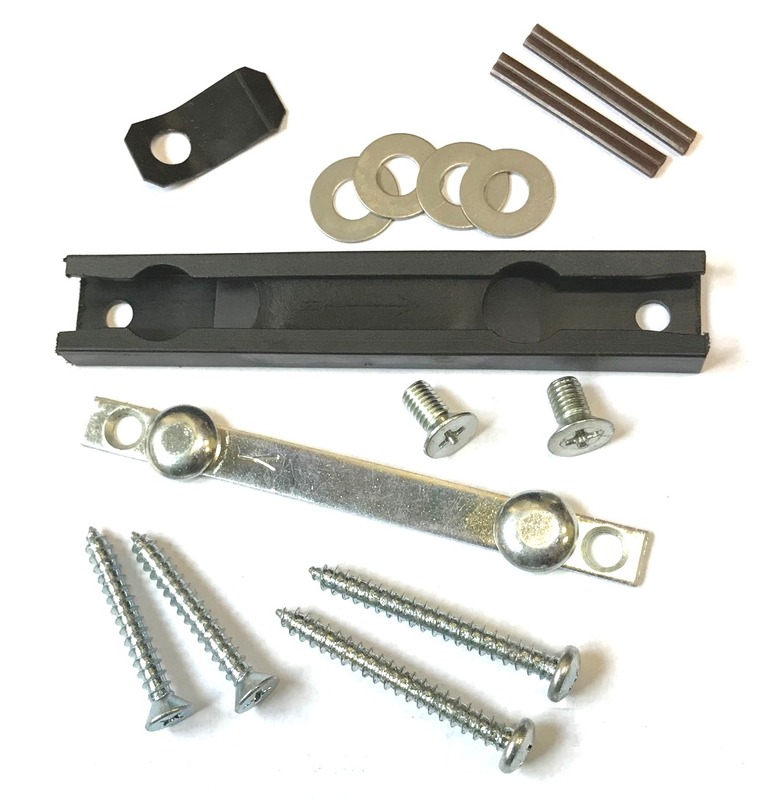 Kit includes: Black channel unit, metal alignment bar, retention spring and all the needed screws to convert the standard NECG "Universal" or "Quick Mount" Recoil Pad to detachable. 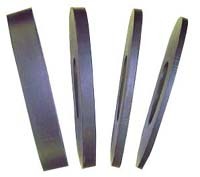 NECG "Universal" Recoil Pads come in: Four Thicknesses: 3/4", 1", 1 1/4" and 1 1/2". Three Colors: Black, Brown & Red. Two Sizes: Medium & Large (Dimensions listed below). 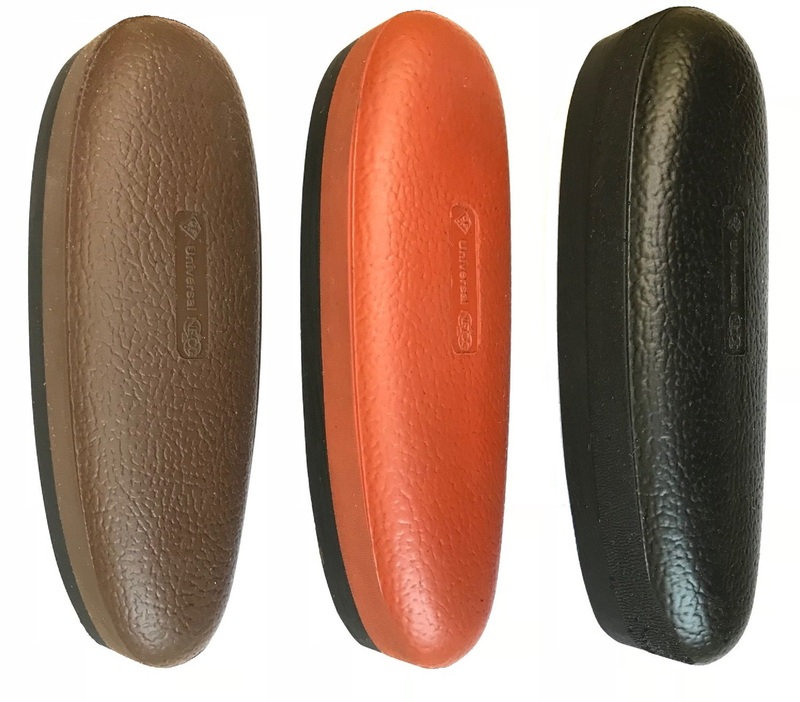 They feature a "leather" grained face with rounded edges. The rubber used is very soft and recoil absorbing however it has a memory. The pad will not deform or flatten if the gun is stood up on a hard surface for an extended period of time, like other brands. The pads are very easy to grind and the base material sands and finishes up very nicely. Many gunsmiths comment on the ease of fitting and finishing our pads.TIP: The 1 1/4" pads work extremely well on taming recoil and the 1 1/2" pads also come in handy when more length is required. Each NECG "Universal" Recoil Pad is pre-slit and will come with two wood screws for direct attachment. Sizes: Medium and Large. 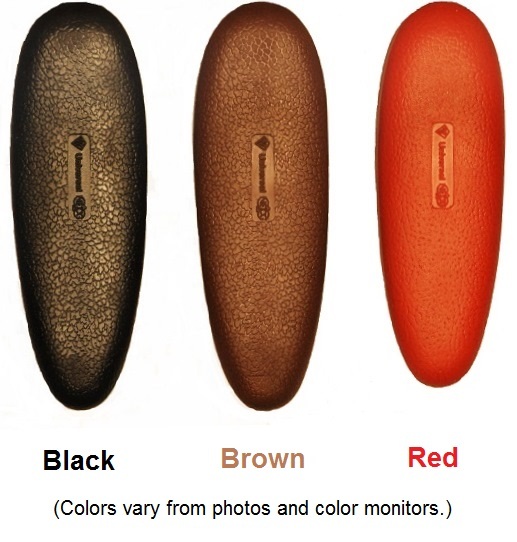 Color: Black, Brown or Red. Thickness: .750" - 1.00" - 1.25" - 1.50"
NECG "Quick-Mount" Recoil Pad has all of the advantages of the NECG "Universal" Recoil Pad combined with a extended hard heel to help eliminate pad "hang-up" when shouldering the gun while hunting or shooting events. Available in Medium and Large sizes, they can be ordered in either Black or Brown and are supplied in four thicknesses: .750",1.00", 1.25" and 1.50". 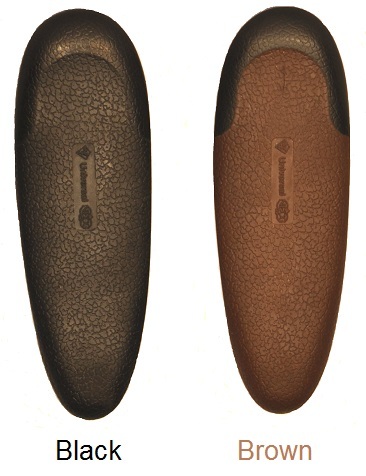 Gunsmiths will find that the hard extended heel is easily shaped and finished. 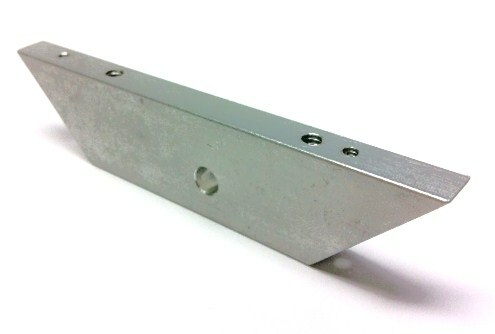 Each NECG "Quick-Mount" Recoil Pad is pre-slit and comes with two wood screws for direct attachment. Sizes: Medium and Large. 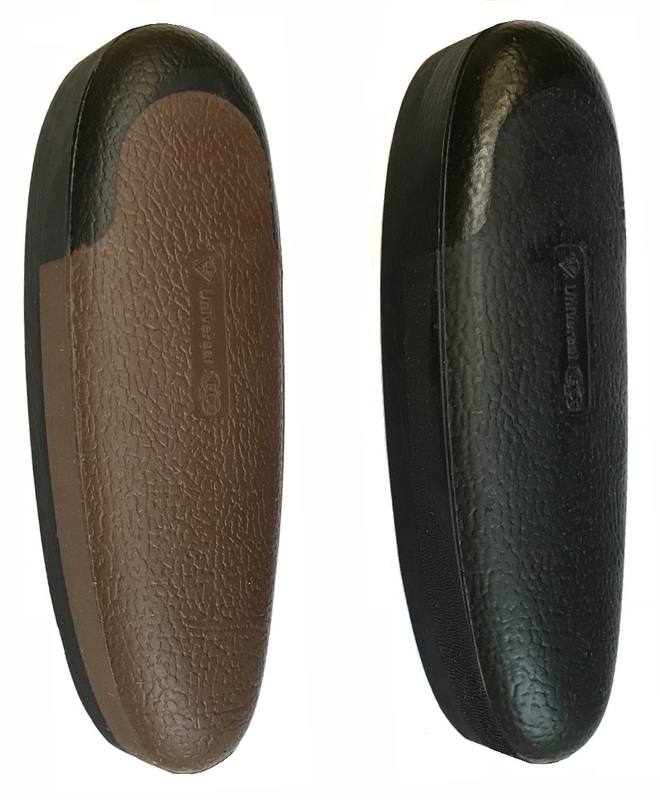 Color: Black or Brown. Thickness: .750" - 1.00" - 1.25" - 1.50"
Medium Pad Height: Minimum 4.60" Maximum 5.40"
Medium Pad Width: Minimum 1.50" Maximum 1.75"
Large Pad Height: Minimum 4.60" Maximum 5.75"
Large Pad Width: Minimum 1.50" Maximum 2.00"